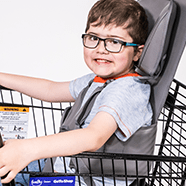 The GoTo Shop is an adapted shopping cart suitable for kids with special needs who require extra postural support, head support and a secure five-point harness. It features an open front for easy transfers, adjustable head and lateral support, a fully adjustable cushioned five-point harness with a maximum user weight of 35kg. The adjustable head support slides up and down to the ideal height for your little one. 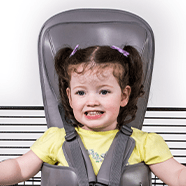 The laterals move high, low, wide or narrow to give the child a reassuring ‘hug’ - just like the much loved GoTo Seat. 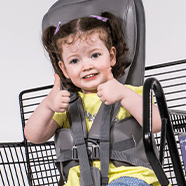 Kids are supported by a safe abd secure 5-point harness - meaning families can shop for longer. The GoTo Shop seat is made from a soft cushioned material, meaning kids are happy and comfy. 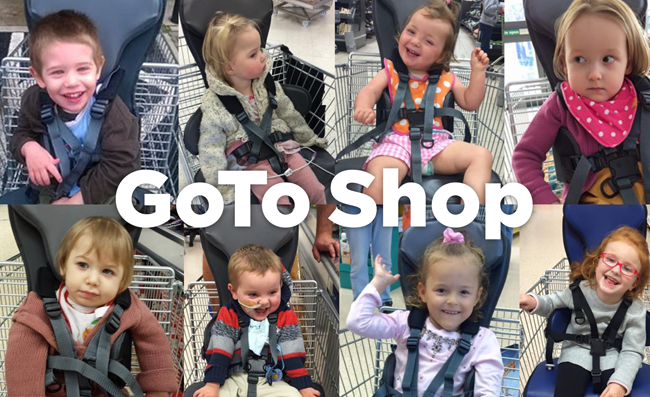 The GoTo Shop has been transforming shopping trips for special needs families in the UK since 2014 and is now available for distribution in the US! If you would like your local store to provide a GoTo Shop, join the campaign by downloading our campaign leaflet and handing it in or emailing it to your store manager. If you’re a retailer and are interested in purchasing a GoTo Shop, please contact [email protected]. View and download literature for the GoTo Shop, including campaign information, product brochures, technical information and more. Campaign leaflets for parents to hand to stores after visiting. Check out the differences between a GoTo Shop Cart and Caroline’s Cart. Campaign leaflets for friends to hand to stores after visiting. Suitable for younger children with special needs aged up to 8 years (or 77lbs) approximately, who require head and upper body support.